On the 8th of March, we celebrated the Women Day. For your March JoahBox, we selected some beauty product to enhance your inner beauty in a simple way. Discover all of our selection just here in this Mars 2019 Joahbox Unboxing. Swipe, blend, and go – effortlessly master natural to smoky eye makeup looks with Stay Put Eye Stick ! Designed with a sliding gel formula, it glides on the skin like a dream, blends easily, and sets to be completely smudge-free. They come in a matte and shimmery versions. Keep an eye on our Youtube Channel for video tutorial for some cool eye looks by our Makeup Artist. 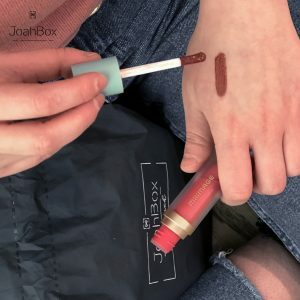 At JoahBox, we are using the Water Rising Tint for almost 2 months now and we are loving it ! The water rising formula provides gloss up effect to the lips. Color pigments tint the lips, and the transparent gloss rise up to the surface for moist and clear texture. The lightweight water texture spread on lips without stickiness, and rich water coating gloss creates volumptious pout. Pure and clear colors lasts long. #JoahTip : Apply a suitable amount on lips from center to outwards. Adjust the number of layer to create the color you desire. Dual-active formula of Natural Cellulose and Apricot Seeds exfoliates dead cells and brightens dark spots without irritation. This is a very mild and refine peeling gel, formulated with Ginseng (korean typical healthy roots) and White Truffle. Also, this peeling is cruelty free, hypo-allergenic and use extract of real plant, roots etc. How to use : After cleansing your face, dry it with a towel. Then take a proper amount of the peeling and apply it gently. Massage it making circles. Rinse with warm water and finish the rest of your skincare routine. Azulene is an organic compound derived from the steam distillation of chamomile. 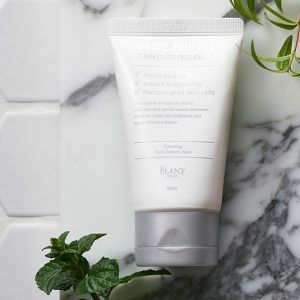 This cream is a calming, soothing and balancing cream with Azulen, a potent anti-inflammatory for fast relief of redness and irritations for a radiant complexion. How to use : Use once to twice a week or whenever a calming effect is required. Apply after cleasing, toning and ampoule or serum. Apply evenly onto the face, neck and décolleté. 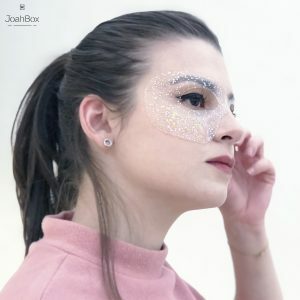 Let’s bring some fun into the Sheet masking game! The Eye Mask Night is perfect for a sheet masking selfie. It’s a hydro-Gel type of sheet-mask providing hydratation and cooling effect. 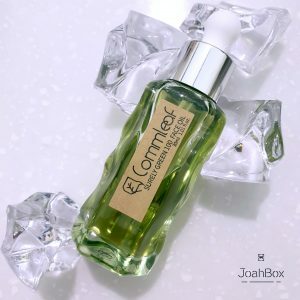 How to use : After using toner or the Jelly Mist from your February JoahBox, apply the mask after removing the protection film and leave it on for 20 minutes (#selfietime). When removing it, don’t forget to gently pat remaining essence until fully absorbed. 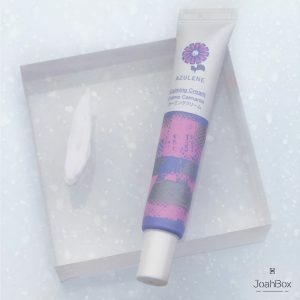 This sample size product was curated for you to test and let us know if you want to see the full version in upcoming JoahBox ! It is a 100% natural Face Oil, vegan friendly. Formulated with 10 kinds of nature-originated oils. 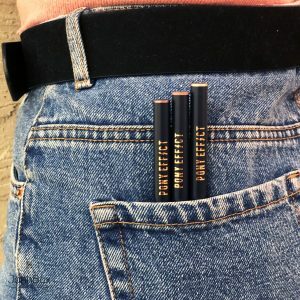 Commleaf is a cruelty free brand. 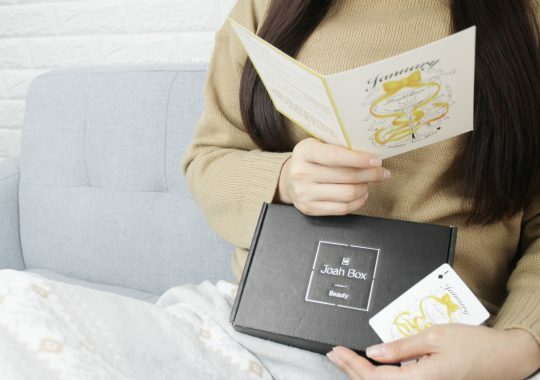 Please give us your thoughts on this March 2019 JoahBox Unboxing ! What was your favorite product and what do you expect in your next box ? Don’t forget you can order your korean beauty box here.